Corn Dosa is a popular South Indian Breakfast Recipe made with corn and rice flour. 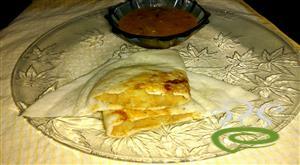 These are crispy and tasty dosas made in few minutes.This could be a best alternative to serve kids in a healthy move. The corn is ground up with spices and moong dal and made to a batter. This batter is garnished with coriander leafs or kasturi methi up to our tastes and made to dosa. Multi dal dosa is a mixed dal dosa recipe. It is very easy to prepare and does not require to ferment the batter. The dals and rice are soaked together for a couple of hours and ground to a smooth paste. The spices are mixed up to this batter and dosas are prepared without letting to ferment. This instant multi dal dosa is so tasty and healthy. Macroni is best always made for salads, but here is a different try to give it a stuffing to dosas. Surprisingly it was so tasty and yummy . Kids loved it a lot and it is a filling dish on its own. Vegetables were sauteed in oil and cooked macroni was added to it to make this stuffing with mild spices. This stuff can be used for both dosa and rotis. These are absolutely soft and delicious ash gourd dosas. Ash gourd dosa is a tiffin recipe. The Ash Gourd is also called white gourd or winter melon is a native of South. It is a low calorie vegetable.For this soft and fluffy dosas we take the pulp of ash gourd and mix it up with finely ground urad dal to make this batter. These dosas move best with coconut chutney. Curry leaf dosa, is a healthy flavourful green dosa with the inclusion of huge quantity of curry leaves to the batter.This is an authentic recipe. Curry leaves are natural flavouring agent.The curry leaves must be bringing an awesome flavour to the dosa. this is a best and great way to include a load of curry leaves in our daily diet. Rava dosa is a very popular South Indian Breakfast which is very easy to prepare.It looks like thin crepes. This is a mouthwatering culinary delight. Rava dosa is a delectably crispy dosa that can be prepared instantly. Rava dosa made by soaking rava (Semolina), rice flour and maida. The batter is prepared in such a way that it is so thin and easy to spread. Cashews ,ginger ,pepper corns enhances the taste of this simple rava dosa. This kambu dosa is also known as bajra ,this is rich in calcium,iron and fiber. This fermented batter to make this kambu dosa smells so fresh and smooth. This dosa is so delicious and it is very simple to make. It is said that pearl millets are more easily digestible than wheat. in this way of preparing the batter you can spread the dosa very thin so that it turns crisp with ghee or gingelly oil. And this dosa goes well with coconut chutney or tomato chutney. This is a very unique recipe. This masala dosa is very tempting and loved by all. No need of side dish for this recipe, but can go with coconut chutney. Sweet Potato is more healthy and very good in taste. 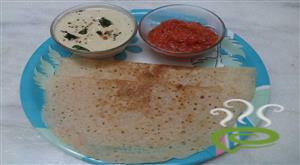 Wheat Butter Dosa is an fast to prepare instant pancake made with whole wheat flour and pan fried. This buttery dosa will be loved by kids and can be served as a healthy breakfast. Instant ragi dosa recipe is healthy with only ragi. 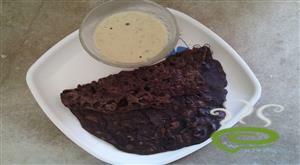 Healthy, easy ragi dosa with chutney makes a great breakfast or dinner on busy days. Dal dosa is healthy, nutrition does made with different legumes, rice and spiced up with ginger, chili. This dosa has lots of proteins with low level of calories. This dosa is the served as a breakfast along with chutney. healthy makka chola dosai in Tamil nadu is famous Recipe. this is good break fast recipe.